These earrings display a pair of tiny small 10mm round high polished endless hoops. They are lightweight, have a comfortable fit and are a perfect size. They can be used for cartilage, nose, lips, ears and body piercings for single or multiple piercings. They are crafted of 14k gold. Gemstar USA is a collection of jewelry that adds diversity and design to your wardrobe. It includes Jewelry for Women and Jewelry for Teen Girls whether you prefer the glamour look, urban fashion or rural style. Our jewelry is great as gifts or can be worn for holiday parties, Christmas, Valentine’s Day, Mother’s Day, Thanksgiving, Hanukah, Prom, Birthdays, Anniversaries, Graduation or any private special occasion. Gemstar USA provides an awesome variety of styles and design such as Bracelets for Women, Bracelets for Teen Girls, Earrings for Women, Earrings for Teen Girls, Necklaces for Women, Necklaces for Teen Girls, Rings for Women and Rings for Teen Girls! Click on our Storefront for more stylish and newest jewelry! 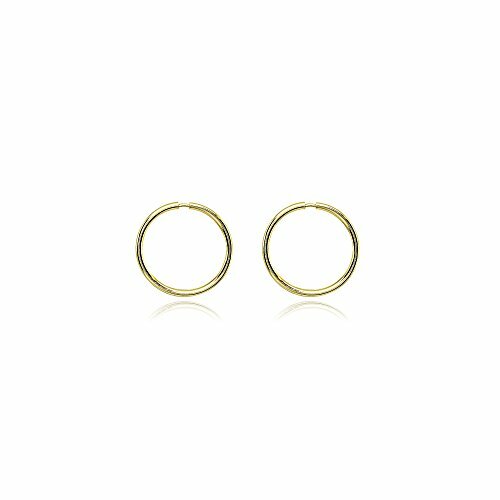 FEATURE - This fashion hoop jewelry earrings display one pair of 10mm high polished endless hoop earrings. They can be used as a hoop nose ring, hoop belly button rings, hoop body jewelry, hoop cartilage earrings, lip hoop rings, eyebrow hoop rings and hoop piercing earrings. This earrings set should be an addition to your fine jewelry or fashion jewelry collection. It can be purchased as hoop earrings for men, hoop earrings for women, hoop earrings for adults or hoop earrings for teen girls. CRAFTED - The endless hoop earrings are created of fine 14k yellow gold. It is tarnish free. NOTE: Closure is a bit tight; it will adjust after a couple of uses. SATISFACTION - We offer a 30-day satisfaction money back guarantee. If you're not satisfied for any reason, you will receive a full refund upon returning your purchase within 30 days. PACKAGING - Jewelry packaged with a nice pouch ready for gifting. ABOUT - Our jewelry collection is an assortment of hand selected fine and fashion jewelry. We carry an expansive selection of gemstones, cubic zirconia and precious metals. This includes a variety of pendant necklaces, dangle, drop and stud earrings, hoop earrings, tennis and line bracelets, rings, polished jewelry, birthstone jewelry etc. If you have any questions about this product by Hoops 4 Less, contact us by completing and submitting the form below. If you are looking for a specif part number, please include it with your message. 14k White Gold Oval Hoop Earrings, 1"